Travel north on I-75 over the Tennessee state line to Hwy 153 North. North on Highway 153 approximately 7 miles to Amnicola Highway. 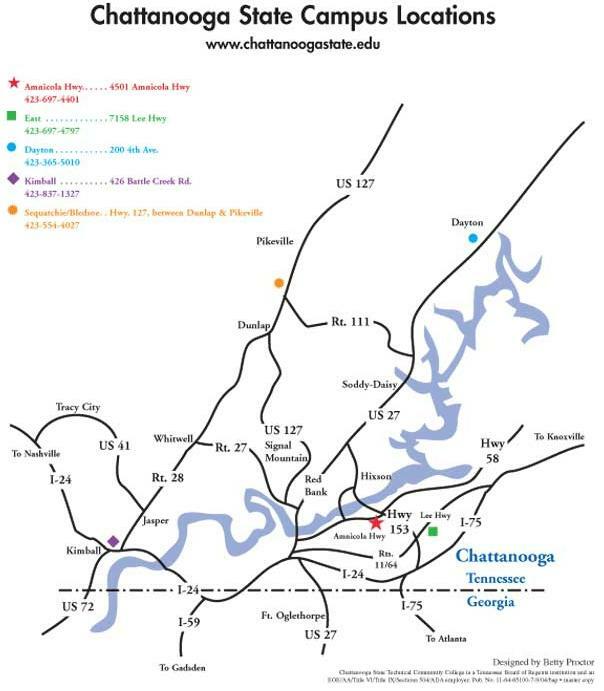 Chattanooga State is approximately 2 miles on the right. Travel north on I-59 to I -24 east. North on Highway 153 North approximately 7 miles to Amnicola Highway. From 153, DO NOT turn at main entrance to campus. Go thru the light and immediately on right you will see Chattanooga State/Olan Mills sign. Turn at the sign and we are the first building on left. From downtown, go past Coca Cola Co., go under bridge and across railroad tracks. Ahead you will see a traffic light and main entrance to campus. BEFORE you get to traffic light, you will see Chattanooga State/WACKER INSTITUTE sign on your left. There is small pond in front of building and visitor parking directly in front. Park in visitor parking and come in front door. The lady at front desk can assist you.